To chide me for loving that old Arm-chair ? And a sacred thing is that old Arm-chair. To fit me to die, and teach me to live. As I knelt beside that old Arm-chair. And turned from her Bible, to bless her child. When I saw her die in that old Arm-chair. And Memory flows with lava tide. My soul from a mother’s old Arm-chair. 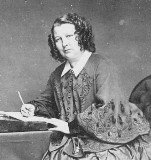 Eliza Cook (1818 -1889) was born in England, the daughter of a local tradesman. The son of the music master at a local Sunday School she attended encouraged her to produce her first volume of poetry. As her confidence grew, she submitted poems to a variety of newspapers and magazines and was published on a regular basis. Eventually she published her own weekly periodical of "utility and amusement" called Eliza Cooks Journal. Cook was a proponent of political freedom for women, and believed in the ideology of self-improvement through education, something she called "levelling up." This made her hugely popular with the working class public in both England and America. Like the remembrance of a security blanket. What a lovely poem. I have just read it to our poetry group. They loved it too.